I really like my alcoholic beverages cold. But I do know most whiskeys should be served in room temperature. Although adding ice is an option, I do not prefer this method because when ice melts, the whiskey is mixed with water. Using whiskey stones is good for drinking at home, but I cannot carry my stones around (for instance in a bar). So, what type of whiskey is served chilly so I can order that one when I go to a bar? I know of three at the moment. 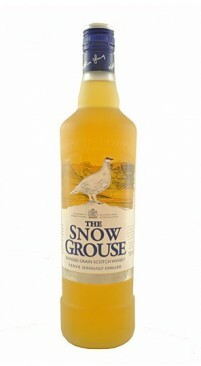 The Snow Grouse was already mentioned and is supposed to be served straight from the freezer. Dalwhinnie Winter's Gold is another one. And very recently, Johnny Walker launched the White Walker (base on the Game of Thrones show). A couple of remarks. The Dalwhinnie expression is the only single malt among the named three. The others are blends of malt and other grains. Any "other" whisky, I personally, would never drink chilled. Neither chilled with ice nor with stones. To explain why, just a little background. Some whisky's are "unchillfiltered" or "non chill filtered". If so, it says so on the bottle. These whisky's still contain lots of essential oils. Chilling them will cause these oils to coagulate and form a hazy draft in your dram. Not what I want. With this in mind, using ice is bad because it will water down your drink on top of chilling it. Using stones is almost equally bad, because though your drink will not be diluted, it will still turn for the ugly. So I would keep drinking whisky at room temp, and if you don't appreciate it now, you'll learn... If you still want a cold one, take one of the three mentioned, as they were purposely invented to this end. Fireball (cinnamon whiskey), although weaker than most whiskey and far sweeter is consistently kept cold. American Honey (Honey flavored Whiskey) is smooth and sweet but has more of a whiskey kick that Fireball. There are several other kinds of flavored whiskey and many are kept refrigerated, but the above two are the most common. For non-flavored the only whiskey I've seen kept on ice, although not consistently, is Yukon Jack. I’ve noticed that Jack Daniels -stocked at every bar- is typically served on ice (“chilly”), especially when mixed with coke.